Drawing inspiration from the sea urchin, Ola provides comfort and style to this cute, versatile wedge. Slim, interwoven straps and a contoured leather footbed add an elegant twist to a quintessential flip flop. From breakfast to the boat, or biking to the beach, this is an essential women’s sandal at a fair price. 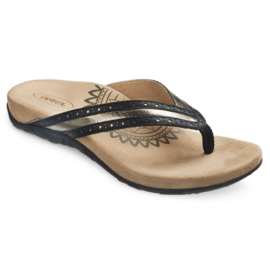 The Reef Ginger sandals feature soft woven polyester straps, Reef-Flex triple density EVA construction with anatomical arch support, and a durable, high density, EVA outsole.